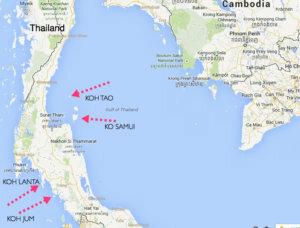 We’ll always remember Koh Tao as the place where we took our first breaths underwater. When Guil and I began planning our round-the-world trip, our research led us to a minuscule island off the coast of eastern Thailand. 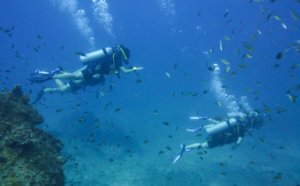 Aside from secluded bays and crystal-clear waters, Koh Tao is also known for its affordable scuba diving. 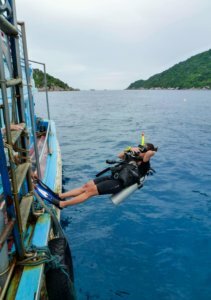 The Thai island is considered one of the cheapest places to secure your diver’s certification, and this caught our attention. Guil and I weren’t avid snorkelers, nor did we know anything about scuba diving. We did however grow up in Miami, so the ocean has always played a prominent role in our lives. 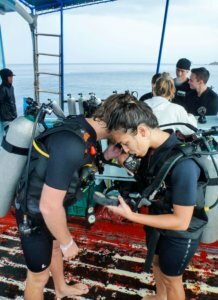 But, just like neither of us had climbed a volcano before our trip, scuba diving was another experience that promised to throw us far outside our comfort zones — and when you’re traveling halfway across the globe, that’s really what you’re looking for. The idea was planted. A couple of weeks ago, it came to fruition. It took us two overnight trains, one bus and one ferry to get to Koh Tao, but we were too excited to rest. 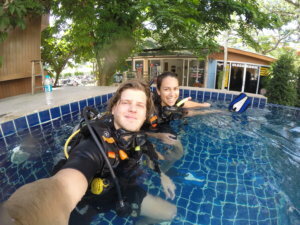 The first thing Guil and I did once we arrived was visit diving schools. We concentrated on choosing a school with stellar reviews to ensure our transition from breathing-human-on-the-surface to mermaid/merman went as smooth as possible. We certainly wanted to be in good hands. We hit the jackpot on our third stop, a mid-sized dive shop called Roctopus Dive, which offered a four-day RAID course including four separate dives. Roctopus works with RAID, which we learned is one of the fastest-growing small agencies and one of the only ones to have gone completely digital. For example, our reading assignments and exams were done through an app on our phones, which was especially convenient since we did most of our reading on the beach. What can I say? Island life is hard. Feeling giddy and incredibly nervous, I made it through my first day of scuba diving school. A quick orientation informed us we’d become certified divers after just three days of training. Three days! How could I learn how to breathe underwater in just three days? Our homework that night introduced us to a slew of technical terms we had never heard before: the BCD, second-stage regulators, neutral buoyancy. Fortunately we’d actually set up our equipment and practice everything we read about the following day. Our second day of class took place in a pool. We set up our tanks for the first time and practiced clearing water from our regulators (our breathing devices); removing and replacing our masks underwater; and breathing from our dive-buddy’s air supply. This is when we took our first breath underwater. It’s funny how terrifying it can be to take your first few breaths even knowing that you’re in a shallow pool. It’s a concept so foreign to the human body; it truly shakes up your nervous system. The third and fourth days of our course were in open water. Our goal was to successfully complete four dives as well as master the skills taught in the pool. On the third day we dropped 12 meters below the surface of ocean, which at first seemed like a frightening depth. One of my greatest fears was sinking to the bottom and not being able to come back up. That was obviously not the case. When you’re scuba diving, you swim underwater just as you would on the surface, directing your body where you’d like it to go. As our group of five deflated our vests and slowly submerged, I felt my fear float back to the surface. The difference between 6 or 12 meters is hardly noticed once you’re underwater. You’re too busy marveling at the world around you. You’re mind is focused on the colorful parrot fish chomping on coral, not the fact that you’re breathing out of an oxygen tank. Breathing underneath the ocean’s surface is the strangest yet most remarkable sensation I’ve ever felt. Once the anxiety fades, a feeling of relaxation washes over you with every breath. You can breathe in as deeply as you want, and exhale as quickly or as slow as you’d like. With every breath, your full lungs pull your body upward toward the surface. The deeper the breath, the more you’ll rise. 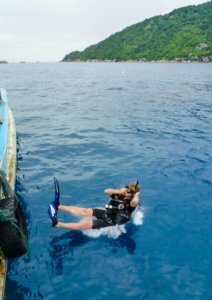 Scuba diving is all about finding a perfect balance — or neutral buoyancy, as they call it. It’s learning how to control your inhales and exhales in a way that allows you to seamlessly move through water with little to no effort. Eventually you’ll feel weightless, as if floating through space. Our second dive was a breeze. I couldn’t wait for day four. On our final day of diving, the weather turned on us. It was 6 a.m. but there would be no sunrise. We were caught in an intense thunderstorm that left us soaking wet in the back of a pick-up truck on our way to the dive boat. “Can we even dive in this?” I thought to myself. I remembered hearing somewhere that the dive goes on, rain or shine. The rain persisted as the boat took us to the dive site. Our instructor told us we’d be diving in a more sheltered site due to the stormy weather. By the time we arrived, the rain had fortunately subsided. But we felt its effects in the ocean. 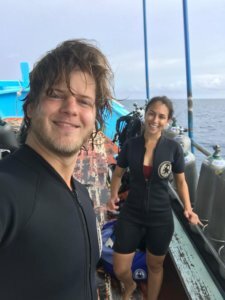 The water was choppy and visibility quite low — ideal conditions for your third dive ever, right? We soon left the storm above and dove underwater. Down there, everything else began to fade. We forgot about the thunder, rain and wind. We were diving, and we were getting better at it. Forty minutes later we surfaced, and the storm had passed. The water at our final dive site was the bluest of blues. Visibility was excellent, and we all swapped our nervousness for excitement. This was our final dive. After this, we’d be certified to dive to a depth of 20 meters on our own. Our time underwater ended far too quickly. 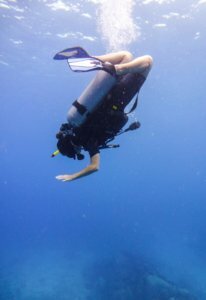 When I saw our instructor signaling it was time to ascend, I nearly swam away. I didn’t want to go up! I wanted to explore this new world I was just introduced to.